Smartly dressed gallerygoers spilled out of brightly lit spaces all in a row Thursday, on what seemed like an evening of openings. 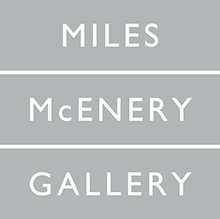 Past a whiff of wine from the makeshift bar flanking the entrance to Ameringer McEnery Yohe, a loud din filled the warm room, ceasing for a moment only when a glass shattered on the floor. The lively reception celebrated the opening of Julio Larraz’s first solo show with the gallery since he joined in 2014. The man of the hour stood in one corner of the brilliant white room, a crowd of people around him. Above a bright red tie and a pair of suspenders, the 71-year-old artist’s face is lined with wrinkles and topped with thinning hair that’s more salt than pepper. His works come on large canvases and hover somewhere between real life and an imagined one, between realism and surrealism. Raised in Miramar in western Havana, Cuba, Larraz has spent his entire adult life outside his birth country. Larraz and his family left Cuba when he was still a teenager, and he’s never gone back. He was 16 when they traveled to Jamaica, as though on a vacation, and continued on to Miami, where his sister was already living and studying. He calls the end “horrendous” and recalls his father’s extensive library being taken out of their home and burned in the garden. Several months after arriving in Miami in 1961, Larraz moved to Washington, D.C., and by 1964 he was in New York City, living first in Hell’s Kitchen and later in the Village—on 10th Street between University Place and Fifth Avenue. He began drawing caricatures that were published by The New York Times, The Washington Post, the Chicago Tribune, Vogue and more. These kinds of caricatures first came into his repertoire while he was in school, where he says he would have qualified as a finalist for Worst Student in the World and often drew his teachers instead of paying attention to them. In later years, he turned to painting, learning from Burt Silverman and other New York artists. At Thursday’s opening, visitors clutching wineglasses and beer bottles and carrying blazers and bags shifted among large-scale paintings. The lines are clean and the colors vivid, and the images are without too many flourishes or distractions. They depict recognizable figures but not necessarily in realistic proportions or proper contexts. Near the entrance, Dreaming in Longhi depicts a view from above a rhinoceros walking in a sand-colored ring, with a handful of spectators gathered in the white stands whose curves and shadows fill half the canvas, from its top right corner to the bottom left. In the opposite corner of the room, Sunset at Cape Laplace shows a small house perched on a rocky surface of gray and white while a huge, round Earth leans on the slope of its roof. The background is a black that feels like an endless expanse, touched with a smattering of iridescent stars. The middle of the three rooms has Guanahacabibes, a trio of canvases in two shades of blue—the darker of which is so beautifully mixed it beckons and drowns the viewer in the expanse of solid color—and cottony puffs of white cumulus clouds. The Asterion Code, on a second wall, shows the lighter and brighter blues and whites of a horizon as seen through a paneless window, a rectangle of light landing on the table and wooden floorboards inside. And finally, the third wall is home to The Faint Light of Proxima Centauri, which depicts a ship populated with tiny human figures suspended on open water. It’s nighttime under the heavy orb of the moon, and the sky is a blue so deep it’s almost black. The yellow glow of man-made light is visible through open doorways on the vessel, as natural light reflecting off the moon turns the water beyond the ship into a white flecked with greens and blues. The last room in the inner loop of the gallery departs from these gradations of blue and white and sets a lighter tone: a frying pan set on the edge of a table, a bouquet of fruit in a basket perched on a pedestal, and a kitten’s face half-visible as it peeks over a table, staring at a hunk of raw meat (it’s titled Obsession). 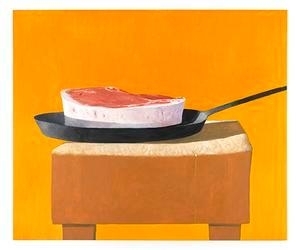 The backgrounds of these paintings are orange, blue and green, while the pinks of the steak on the frying pan echo that of the kitten’s nose and ears on the opposite wall.